I never considered myself a good cook, but since about December I’ve pretty much been the sole cook around here. At first it was just breaded chicken cutlets and rice, the two things I already had mastered. 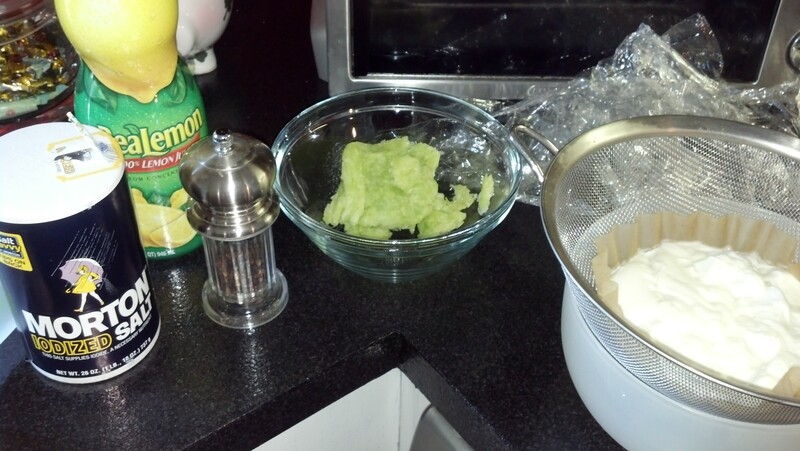 And then it was seasoning meat and making my own meat sauces for pasta. Still simple, but definitely not something I had done before. And then the obsession with the crockpot came. What I slowly learned was that you didn’t have to follow the recipe. I started flinging extra spices in at will, according to my own taste preferences, and eventually started pulling recipes off the internet and just combining bits and pieces of different ones together that sounded good. When I looked in the freezer yesterday, I had a pound and a half of beef frozen that was supposed to be used for stew. But to me it’s not stew weather anymore. Solution? I decided to make shawarma. If you don’t know what shawarma is, you have to find the closest Middle Eastern restaurant to you and run out and try it. I read one recipe online that referred to it as a Middle Eastern Taco, but that doesn’t do it justice. I’ve eaten and loved shawarma for quite a few years now, but have never tried to make it. So I started pulling recipes offline and finally found a Lebanese beef shawarma recipe that sounded manageable. And then I changed it to what spices I owned. First thing you should know, is that unless you have a plethora of spices in your house this isn’t a meal you can just cobble together with what you have in your cabinet. Honestly, if you didn’t already own all the spices, and depending on the recipe you used, purchasing them could cost a small fortune. I was lucky that I only needed to buy cardamom and it was THIRTEEN DOLLARS. Which I think is ridiculous. 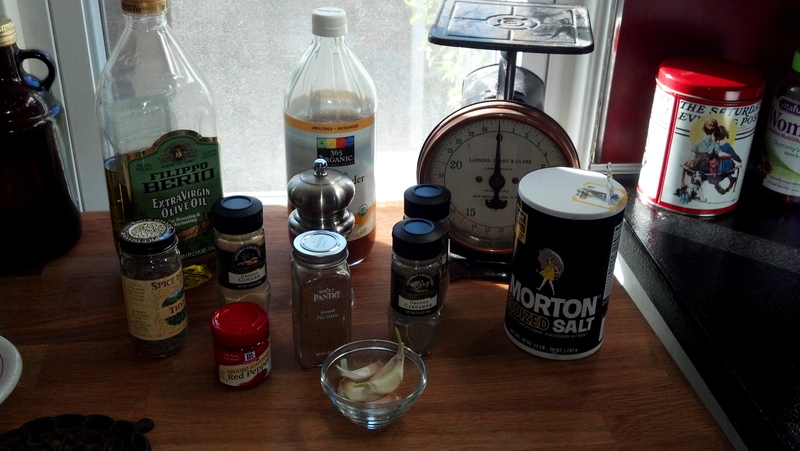 Here is the main list of ingredients for the marinade. While the recipes I pulled from all said it was for about 2 pounds of beef (preferably a fatty cut), I think anything over that much beef would stretch the marinade too thin. 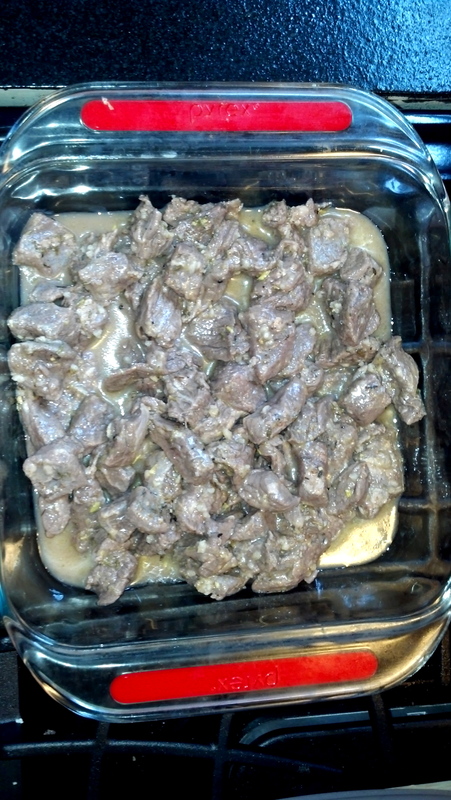 Mix the spices, lemon juice, and apple cider vinegar in a bowl/container large enough for the marinade and beef. 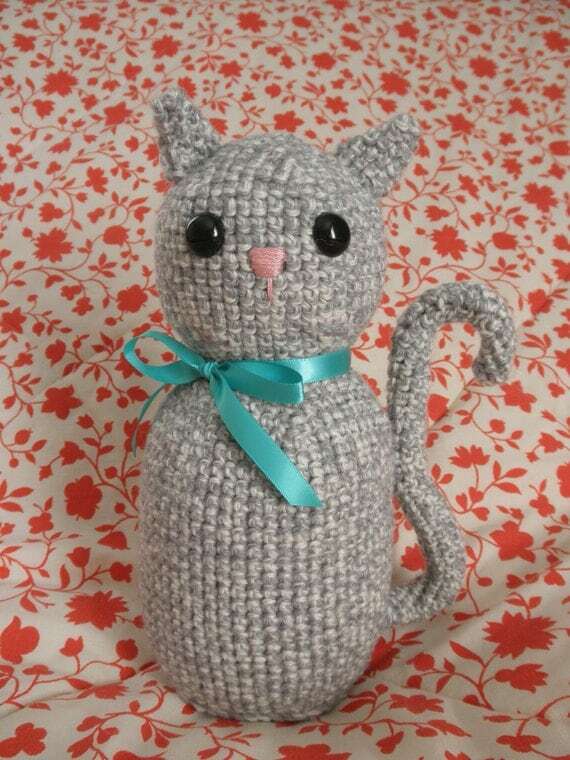 (I recommend one with a cover) Whisk vigorously until well combined. 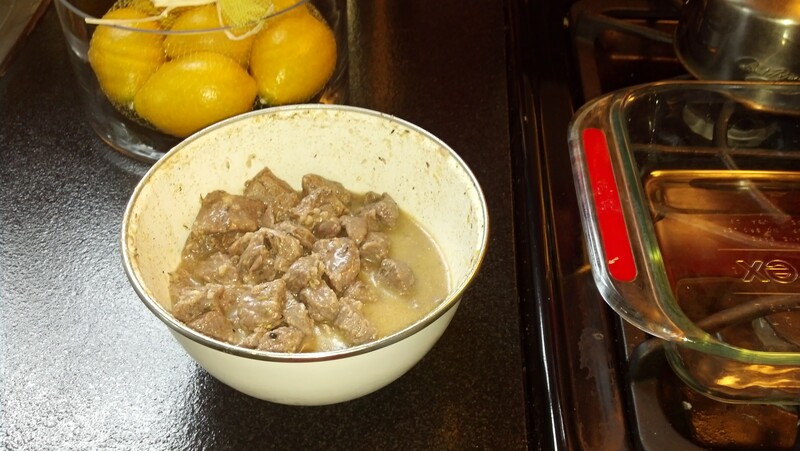 Add your beef, cut into chunks that are bite sized. Stir everything around well, and then add the oil. (NOTE: Several of the recipes I pulled from also called for 1/2 tsp. of both cumin and fennel, but having neither I left them out.) I then put the cover on my bowl and shook vigorously. You want to let this marinate in the fridge overnight. Every few hours give it a good shake and return to the fridge. 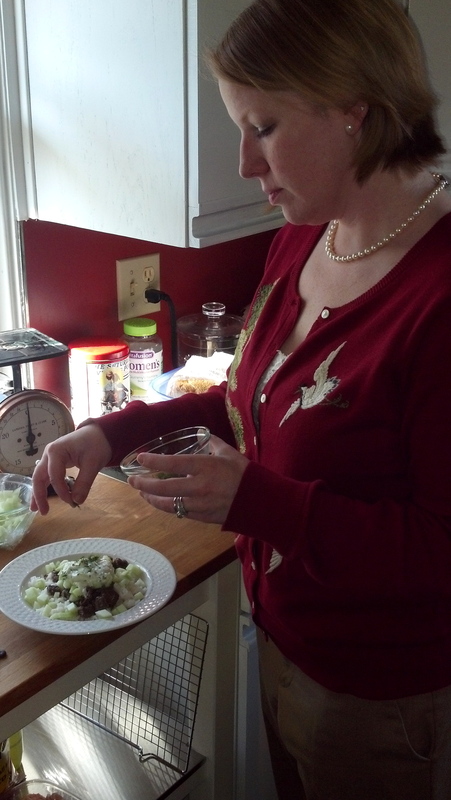 The next day, place the beef in a small Pyrex glass dish. I used a 9×9. Add enough marinade so that the bottom of the dish is just coated. Cover tightly with aluminum foil, and bake for 2 hours at 300F. While shawarma is traditionally served with tahini sauce, the Man and I prefer tzatziki. I decided as long as I was going to attempt making shawarma I might as well make the tzatziki as well. You’ll have to do the first part of the tzatziki the night before also. The next day, you’ll want to leave at least a half hour before serving for the finished mixture to sit. There are approximately a zillion recipes online, but here is what I used and created. The night before, you will need a colander and cheesecloth or a coffee filter. 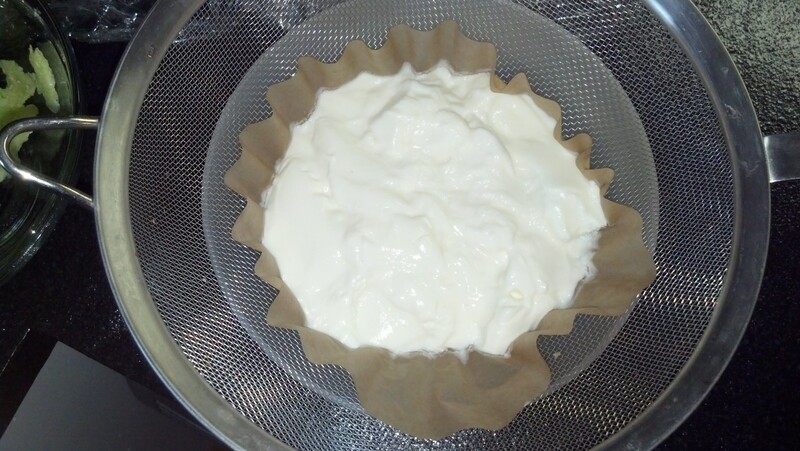 Place your colander over a bowl, line it with your strainer of choice (I used a coffee filter) and put the yogurt in it. Cover everything up with plastic wrap and let sit in the fridge overnight. When you take it out the next day, your coffee filter will be saturated. You will also have a surprising amount of liquid strained into your bowl. 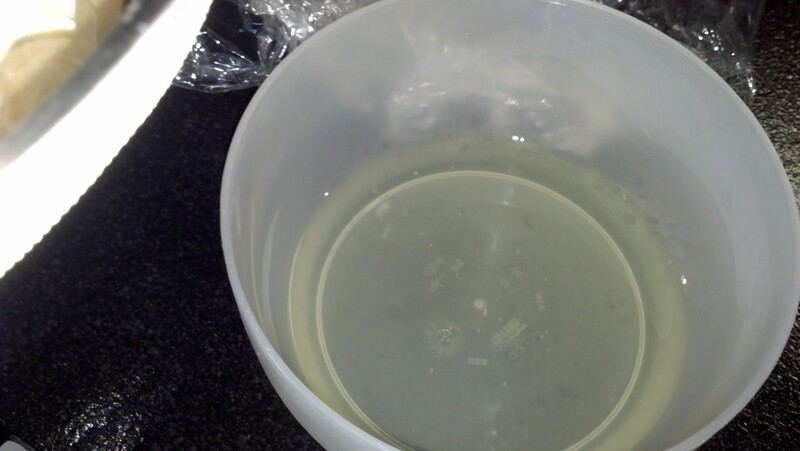 There was at least an inch of liquid in the bottom, even if the pic doesn’t really show it. 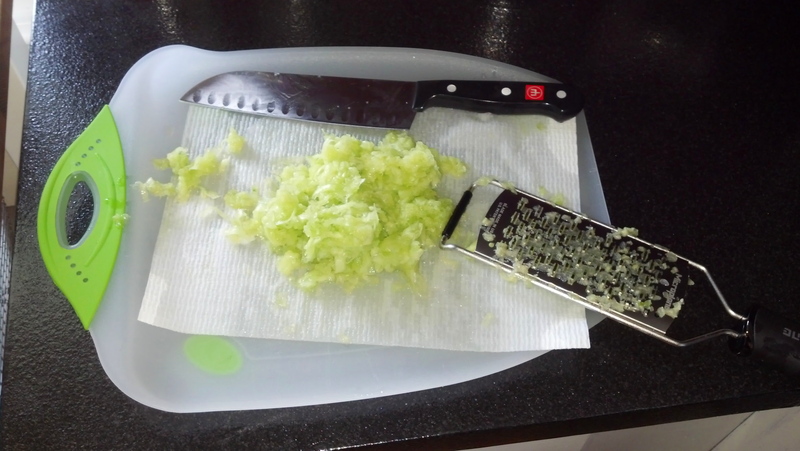 At this point, peel your cucumber and start the grating fun! Now I had no idea how to do this. Yes, that sounds stupid but… I had never done anything but slice a cucumber up for hors d’oeuvres before so I did watch a video on how to peel a cucumber and the trick is just a sharp knife and patience. Oh, and when grating, do not grate your fingers. Trust me. I used my handy dandy Microplane grater. You want to remove as much moisture as possible from the cucumber. What I did was grated directly onto a paper towel. I then picked the paper towel up, put a thick kitchen towel underneath, a paper towel on top of the mash, and another kitchen towel on top. You want to let this all sit FOR ABOUT AN HOUR in the fridge. This will give the maximum time possible for the liquid to drain out. 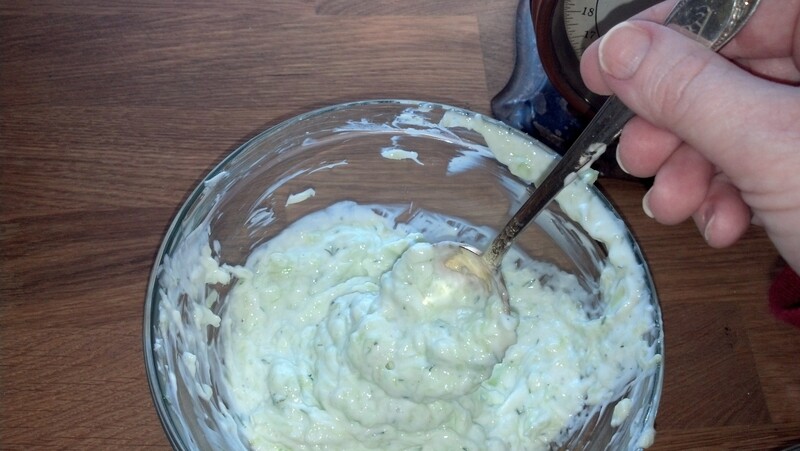 After the cucumber is sufficiently sapped of its moisture, combine everything in a bowl and mix. I did everything to taste as I went, but as a base probably use a 1/2 tsp. of everything. 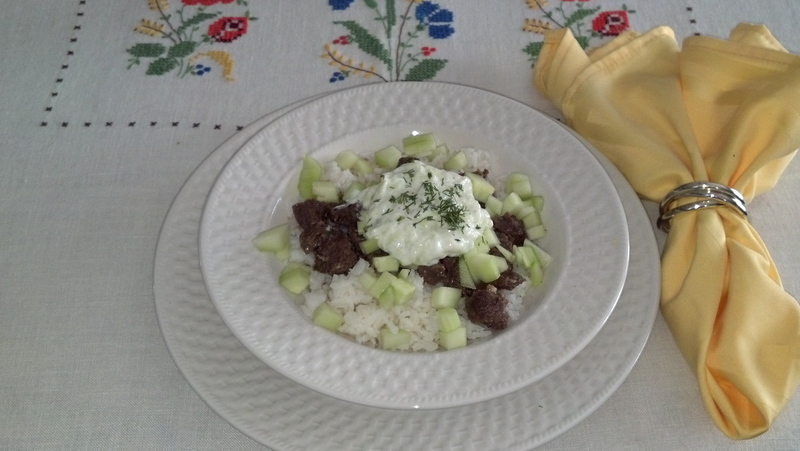 The sauce will not be as thin as the tzatziki you’ve probably had on gyros, but it is equally yummy if not a bit lumpy. Recommendations ranged from letting the tzatziki sit in the fridge from an hour to four hours for the ingredients to all combine and give the best taste. I gave it a half hour at best. No matter what I say serve chilled. I served everything over white rice (South Carolina long grain if you must know) along with a sprinkling of dill and diced cucumbers. Then my favorite part – garnishing! And then finally, the presentation. I have to say that the taste wasn’t exactly the same as I’ve had before, but it was damn good. I will not make a good Middle Eastern housewife anytime soon, but I’m glad I tried it and I can’t wait to try making it again. To my friend Radwan – do not show this to your mother. She would probably laugh at me and my recipe. However you are welcome to come over and try this anytime and give me your unofficial review! If I have learned anything from my forays into cooking, it is that the Man appreciates it no matter what. I’ve also learned that you don’t have to consider yourself a great cook in order to try new things. If you had told me two years ago that I would be cooking dinner on a near nightly basis, I would have laughed at you. Then again, if you told me two years ago that I’d own a house now, I probably would have laughed even harder. I love driving home from working already knowing what I am going to make for dinner! The meal looked fantastic, so proud of you!